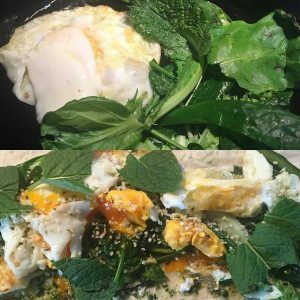 Another Super Natural brekky today – a scrape of my ‘Macadamia + Coriander Pesto’ on spelt #mountainbread topped with an egg from neighbours chooks, wilted greens from my garden and madeinhemp Canadian hemp seeds. 3 mins to prep’. Super yummeeeee and sustains me with joy and energy until lunchtime. Ready for yoga now.